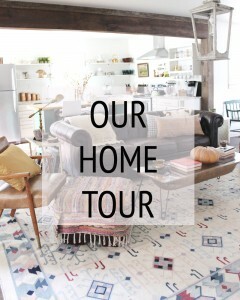 Welcome to Blogger Stylin’ Home Tours Spring Edition! I am so glad you’re here. These warmer days, blooming flowers, and whistling birds have me in the absolute best mood! With a new little baby, selling our house, and searching for a new one, our little cottage hasn’t received too much attention. But knowing that this will likely be the last BSHT this home ever sees, I had to put together a last minute spring edition. This is the simplest tour I’ve ever done for BSHT. 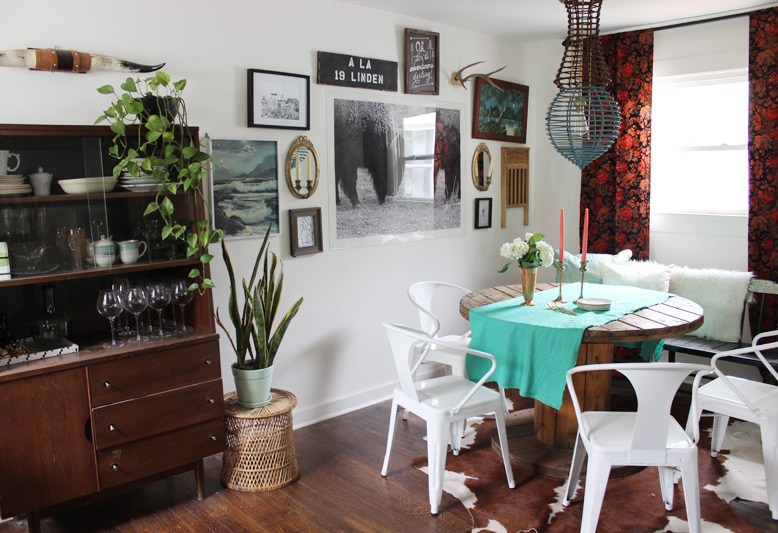 I usually redo a room or something a little crazy. This time around, my goal was to freshen and lighten with only tiny tweaks, which actually feel perfect for this season. 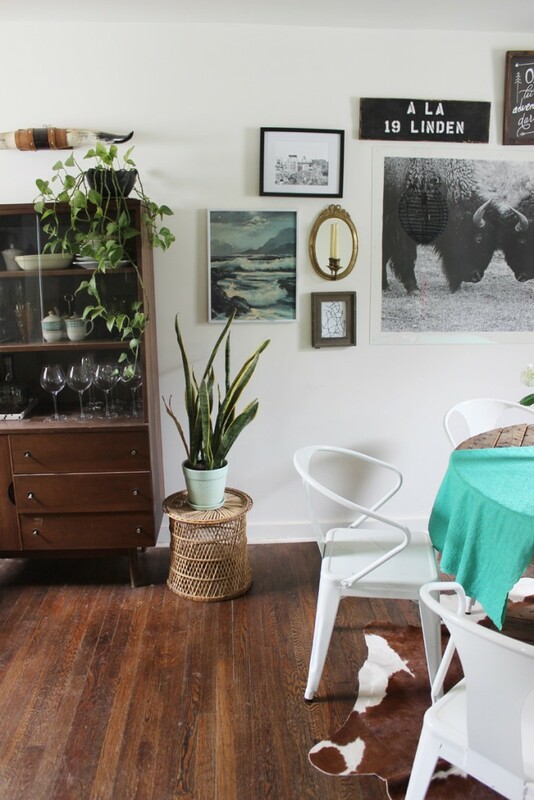 Something about spring makes me want to de-clutter my vignettes and have a fresh slate. 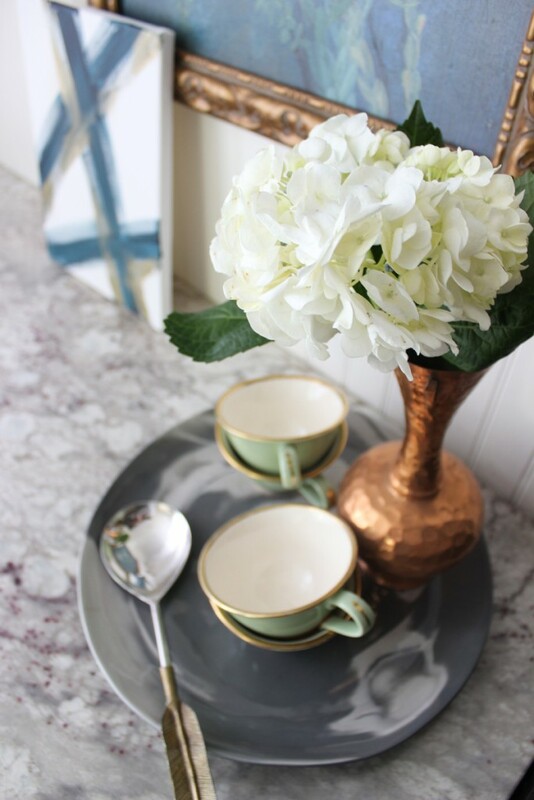 Flowers and greenery are my favorite way to show spring off in my house: both painted and real. 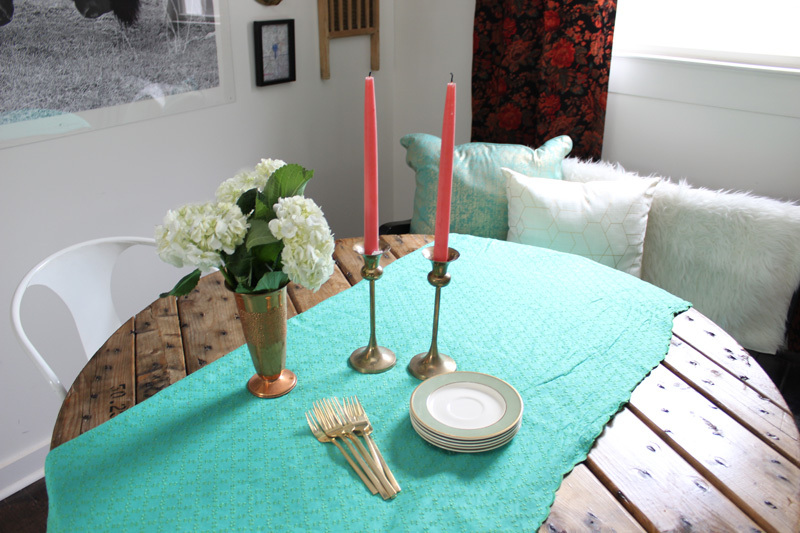 Pulling the turquoise out of the dining room’s floral curtains gave this room a nice, bright pop. And greenery. Lots of greenery. I am notorious for killing house plants. I literally never water them. I mean, how hard is it to sprinkle a little water on even once a week?! I just forget. But I’m proud to say that these two house plants above have survived since last year! That accomplishment makes me happy. 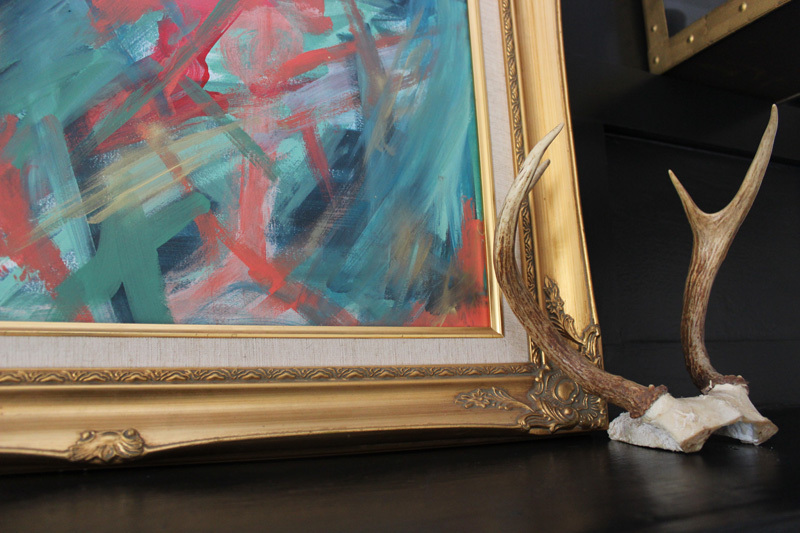 DIY Abstract Art really does brighten a place up. I especially love how it brightens our heavy black fireplace. 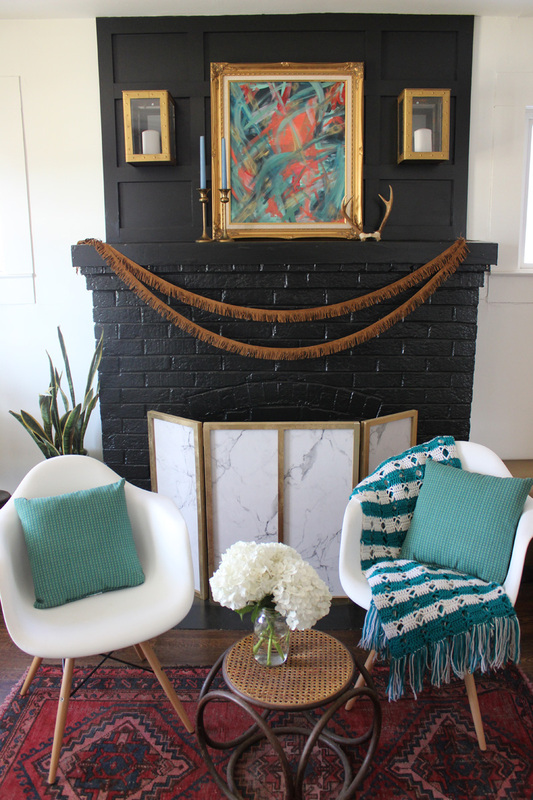 The fireplace redo is one of my favorite projects yet, but it does need some lightening this time of year. Our master bedroom got lightened up as well. 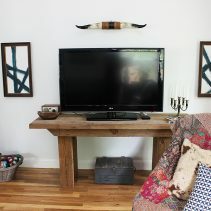 I loved our master when I revealed it last spring, but I just needed a change from the bright colors and heavy floral. 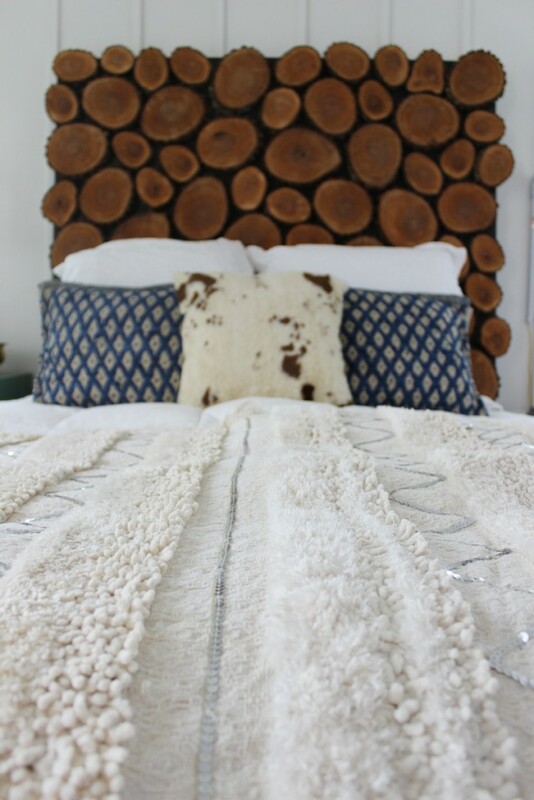 The DIY Moroccan Wedding Blanket gives the perfect style and texture to this mainly neural bed. 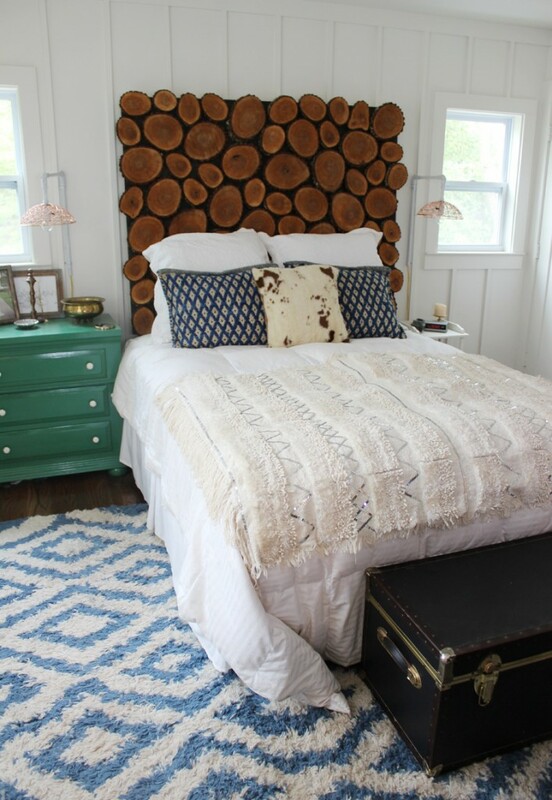 And I’m still in love with our wood round headboard and those copper and white pipe sconces. 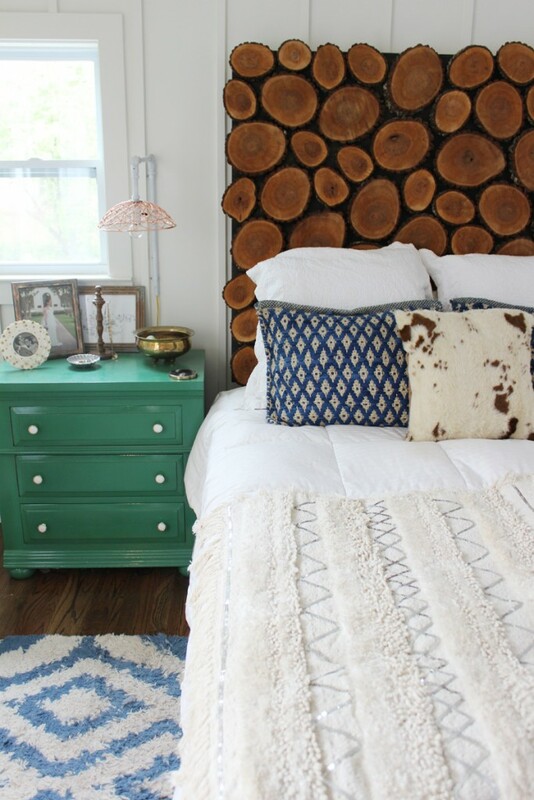 Here’s a little glimpse at our guest room/office combo. I still have some finishing touches before officially revealing it. But the fabric combo screams spring to me, so I had to share it. 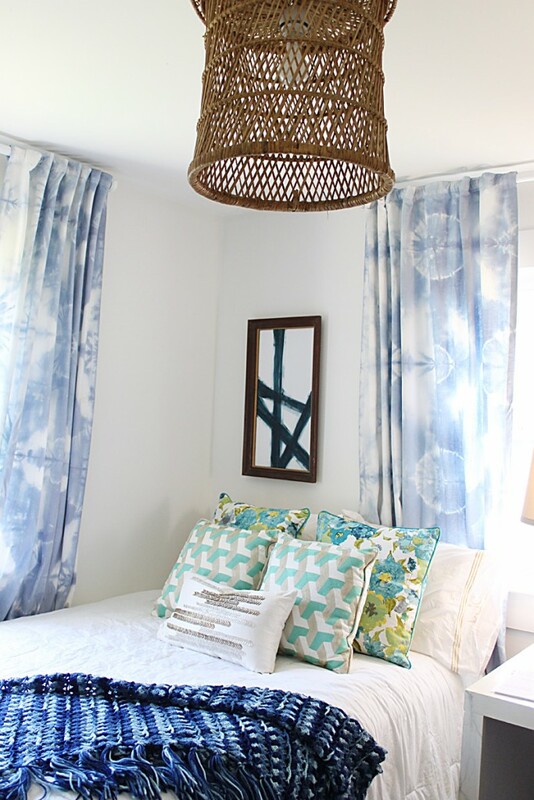 Those tie-dye curtains are still one of my favorite DIY’s. 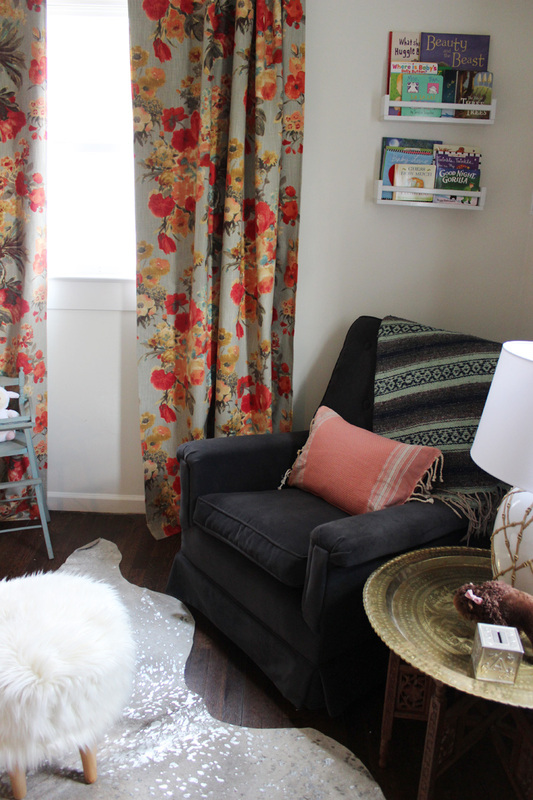 And while this room didn’t get updated for spring, it already felt the most like spring in our house. 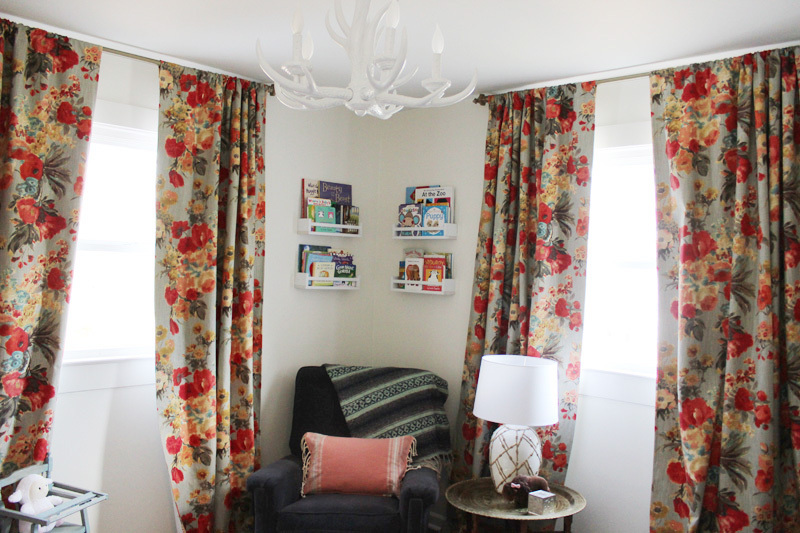 Those floral curtains in Miss Rosie’s nursery still get me every time I walk in the room. Rosie agrees. She smiles up at them whenever we’re in the room. Thanks for touring our spring cottage! I’m so grateful for my sweet and super talented blog friends who signed on with me last minute to make this tour happen before we sell! Make sure you follow along and give them some love! They inspire me every day. Thank you, Julia! I will miss this little cottage! So excited about the next one though! Cassie, in my mind, spring is supposed to be simple! Glad I’m not the only one 🙂 And I know yours will be beautiful too! So pretty, Lindsay. 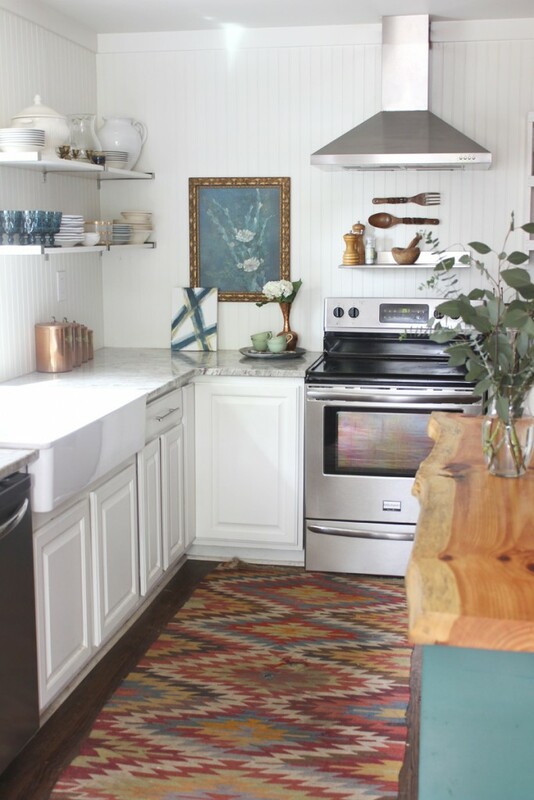 Your kitchen is to die for! How is that little sweetie 2 months old already? I KNOW! It has flown by. She’s actually close to three now. INSANE! And thanks so much 🙂 I’ll miss this kitchen for sure. Looks springy and lovely, Lindsay! And little Rosie…my goodness, the cuteness!! I’m sure it’s hard to believe you’re leaving all of your hard work behind, but I know you’ll find so much joy in the next place. Could she be any cuter?! 🙂 Thanks for putting this all together, Lindsay! I wish mind looked this good! 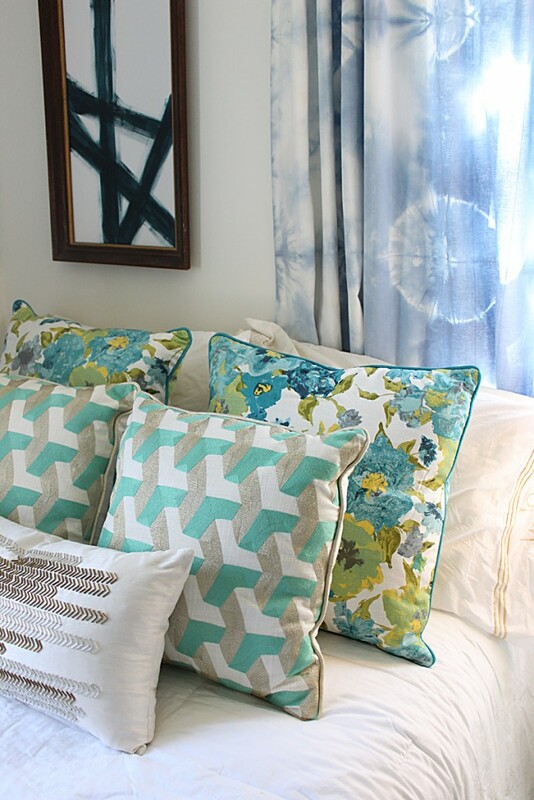 I’m definitely eyeing your tie dye curtains as a possible project. 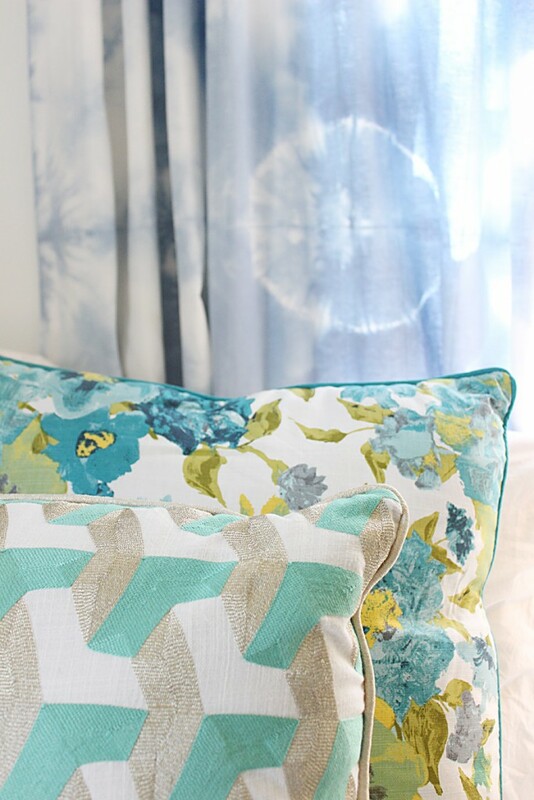 After completing new tie dye pillows I’m in the mood! It’s BEAUTIFUL!! Every space is just such a delight. I feel like we are design soul mates =) xo! Carrie, that is such an honor to be called your design soul mate! 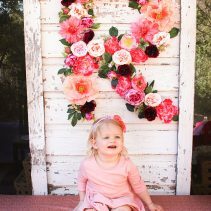 Love your fresh spring colors and that baby Rosie! Can’t wait for all the tours! I will miss this house but can’t wait to see what you do with the new one! I literally kill every single house plant too. We have a half alive half dead one right now that I need to realize is not coming back to life and I should just replace it. Oops! Love everything about your house. Miss you! Glad to know I’m not alone. I love house plants, but never remember to water them. Miss you too, friend! Such a darling home! I love your mix of styles – you pull them together so effortlessly. It will be so fun to see what you do to the next place! Thanks Laura! I’m SO EXCITED for the next spot! Nailed it! I love the way the colors so easily flow into your existing color scheme. That takes talent! And all those graphic paintings are great. 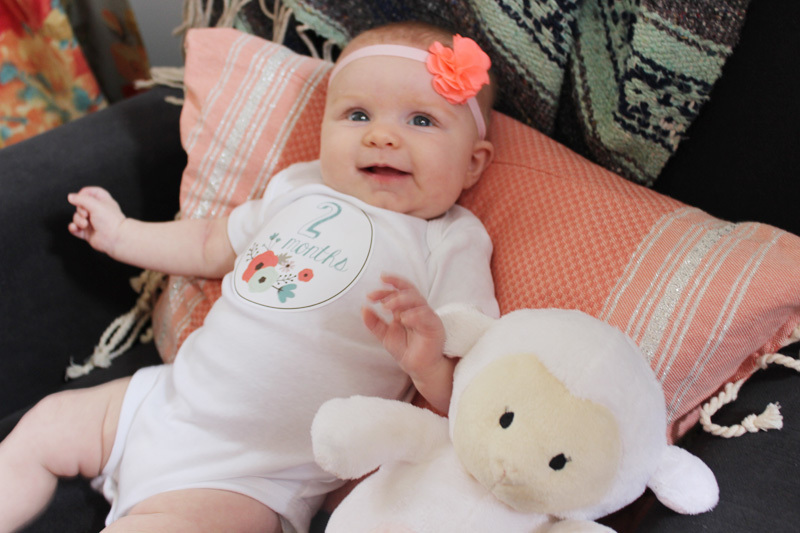 Can’t believe someone is already two months old! Thanks Jennifer! She’s almost three – I can’t believe it! 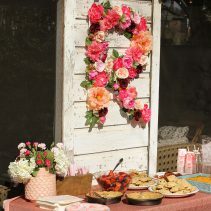 Love, love, love the simple touches and those little sweet cheeks!! EVERYTHING, including sweet Rosie, is beautiful! Thank you SO much for having me this year! Thanks, Amber! Rosie is my favorite thing about this tour! Lindsay — your style is flawless!!! Love every inch of your house! The spring updates are so lovely. Thanks, Claire 🙂 They were simple this time around, but I love doing one last BSHT here! I can’t wait to hear all about the new place! By the way, is there a day of links missing from the bottom of this post? I don’t see me or the other gals from Tuesday! Did I mix something up?? Thanks, Michelle! I am so excited about the next one too! She’s so sweet! Happy Spring! Thanks Shavonda! Simple are the best 🙂 It is bittersweet, but so excited about the new place! Absolutely gorgeous! What a lovely home you have. I am loving all of these tours! 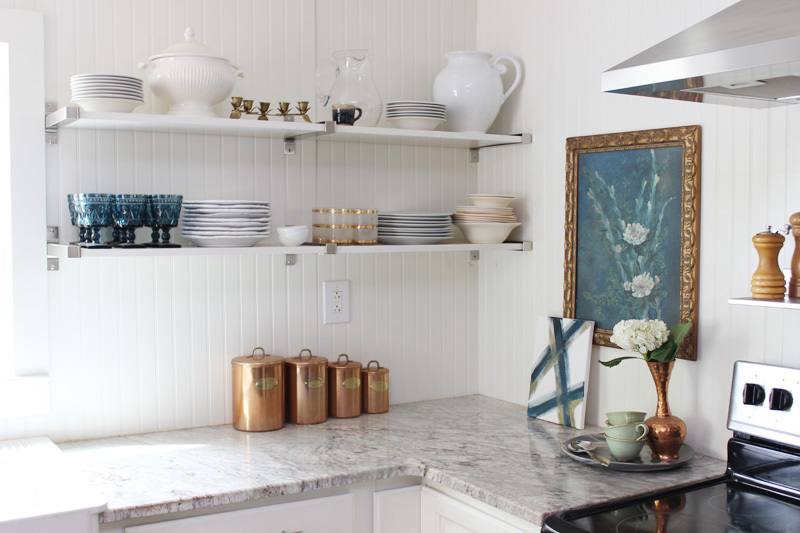 Seriously, your kitchen gets me EVERY time. Just love it! I can’t wait to see what you do with your new home. 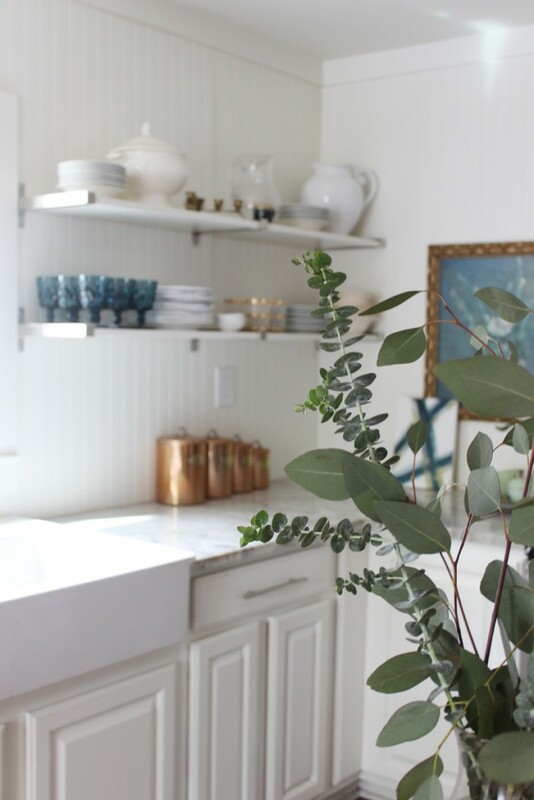 Cottage homes naturally have that spring/summer vibe and that white walled kitchen really brings in the light! 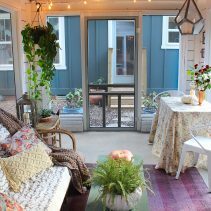 Such a lovely home, happy spring! Love all the floral touches in your home! And miss Rosie is too cute!